REXIS is a coded aperture soft X-ray (0.3 - 7.5 keV) telescope that images X-ray fluorescence line emission produced by the interaction of solar X-rays with the regolith of the asteroid. 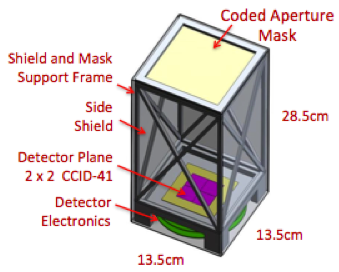 REXIS will use a 2 x 2 array of CCDs (CCID-41 with Suzaku-XIS heritage) for X-ray detection, each with their 1K x 1K 24µm pixels binned by a factor of 32 into 0.768 x 0.768 mm "effective" pixels. Imaging is achieved by correlating the detected X-ray image with a 64 x 64 element random mask made of gold. REXIS will store each X-ray event in order to maximize the data storage usage and to minimize the risk. The pixels will be addressed in 64 x 64 bins and the 0.3 - 7.5 keV range will be covered by 5 broad bands and 11 narrow line bands. A 24 sec resolution time tag will be interleaved with the event data to account for asteroid rotation. Images will be reconstructed on the ground after downlink of the event list (individual image has a FOV of 401 m x 401 m before co-adding). Images are formed simultaneously in 16 energy bands centered on the dominant lines of abundant surface elements from O-K (0.5 keV) to Fe-Ka (7 keV) as well the representative continuum.